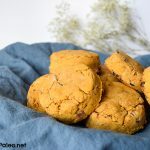 Gluten free & paleo-friendly maple bacon sweet potato biscuits – plus maple ghee for buttering up your hot biscuits. Preheat oven to 375 degrees. Place a wire rack on a foil-lined rimmed baking sheet. Lay the bacon strips flat on the rack and brush with about half of the maple syrup. Bake for 10 minutes. Remove from the oven, flip bacon, and brush with the remaining maple syrup. Return to the oven and bake for 10 minutes or until the bacon is brown and crisp. Remove from the oven. Let cool for a few minutes, then chop. Chill until ready to use. Increase the oven temperature to 425 degrees. Line a baking sheet with parchment paper or a silicone baking mat. In a large bowl, sift together cassava flour, baking powder, baking soda, salt, and coconut sugar. Add chilled butter cubes OR chilled palm shortening and cut into dry ingredients using a pastry blender or two knives until pea-sized pieces of butter remain. Add crumbled maple bacon. In a small bowl, mix together mashed sweet potato and coconut milk. Pour into the butter and flour mixture, tossing with a fork just to combine – don’t overmix! The mixture should be fairly dry. Turn the dough out onto a lightly-floured surface and gently knead a few times until the dough comes together. With your hands or a rolling pin, gently roll or pat the dough into an inch-thick rectangle. Fold the dough in thirds (like folding a letter). Repeat the folding process. Roll or pat the dough into a rectangle 3/4-inch thick. Using a round biscuit cutter or a glass with vertical sides, cut biscuits by pressing down in a single motion. To prevent sticking, you may need to dip the cutter or glass in flour. Gently press together dough scraps and cut biscuits until no scraps remain. Transfer biscuits to the prepared baking sheet and chill for 10 minutes. Bake for 15-18 minutes until the tops of the biscuits are a light golden brown. Remove from the oven and let stand about 3 minutes, then transfer to wire racks to cool. Serve warm with a smear of maple ghee. To make maple ghee (or maple butter), mix 1/2 cup of room temperature ghee (or butter) with 2-3 Tbsp maple syrup. I recommend always serving the biscuits warm – they are dry when room temperature. You can pop them in the microwave for 10 seconds or put them in a warm oven for a minute or two to heat them up.